The SDC-EC25N ExpressCard radio card from Laird combines a high-performance, dual-band 802.11n radio with software, both designed for business-critical mobile devices that operate in harsh environments. No other Wi-Fi radio card can match the range, robust security, seamless mobility, and manageability of the EC25N card. This dual-band radio module operates in both the 2.4 and 5 GHz frequency bands supporting IEEE 802.11n as well as 802.11a, 802.11b, and 802.11g. 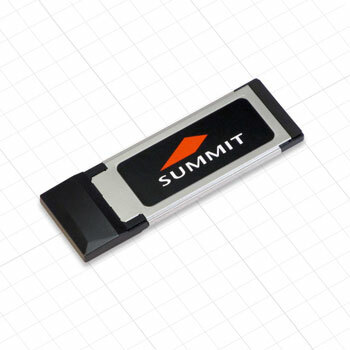 As a result, the SDC-EC25N module is ideal for integration into a vehicle-mounted mobile computer or any other business-critical mobile device. Supported on Windows XP, Windows XP Embedded, Windows 7, Windows 7 Embedded, Windows 8. (NOTE: Windows 8 supported via the compatible Windows 7 driver). Wi-Fi Alliance: 802.11b, 802.11g. WPA Enterprise, WPA2 Enterprise. Cisco Compatible Extensions (Version 4). Transmit: 600 mA (1980mW). Receive: 450 mA (1485mW). Standby: TBD mA (TBD mW).